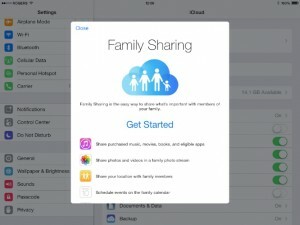 If you have more than one iPad and/or iPhone in your household, you should definitely set up Family Sharing. Along with allowing up to six members share photos and purchased apps, it also allows for parents (or a single member) to control spending in the App Store and iTunes. Confirm that you want to be the family organizer and that you’re signed in with your personal Apple ID. You can add anyone who has an Apple ID to your family, as long as you’re both using iOS 8 or OS X Yosemite on your devices. You can also use these steps to add a child to your family group. Go to Settings > iCloud > Family > Add Family Member. Enter your family member’s name or email address. In iOS 8 on your iPhone, iPad, or iPod touch, go to Settings > iCloud > Invitations. Confirm your Apple ID and password. Choose if you want to share your content and which iTunes Store account you want to share from. Choose if you want to share your location. If you agree, your location can be displayed on family members’ devices in Find My Friends and Messages, and the location of your shared devices will also appear on family members’ devices in Find My iPhone.